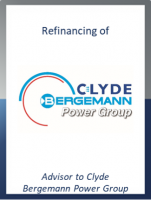 GCA Altium acted as exclusive financial advisor to Clyde Bergemann Power Group on the refinancing of its debt capital structure. Clyde Bergemann Power Group (CBPG) develops and manufactures components and systems for energy-related production processes. The company employs some 1,500 people worldwide. Its products are used on all five continents to operate power plants as well as industrial plants, waste incineration and petrochemical facilities efficiently, safely and with low emissions. In addition to new product sales, the company also provides a full range of services related to its systems and solutions. Effective April 2016 then-minority shareholder Qiang Xu acquired the shares of majority owner Deutsche Beteiligungs AG and the other shareholders. His family office thus now holds 100% of Clyde Bergemann. For many years, Mr. Xu was Vice President & COO of CBPG with responsibility for its Asian business. As part of the change of ownership, the Group's balance sheet was substantially strengthened via a capital increase as the catalyst for new growth. In December 2016, Clyde Bergemann was also able to conclude new syndicate financing worth USD 180 million. "The new funding enabled us to replace short-term bilateral finance with long-term syndicated loans where appropriate. By doing so, we have created the financial basis for continuing stability and future growth," said CFO Dr. Patrick von Hagen. In addition to term loans, a revolving line of credit and guarantee lines, the new credit lines also include an acquisition facility. This was used to finance the acquisition of RPT Asia Ltd. in the key growth market of China, which also took place in December 2016. RPT is engaged in the manufacture and sale of systems for desulphurisation of flue gases in power plants and industrial applications.